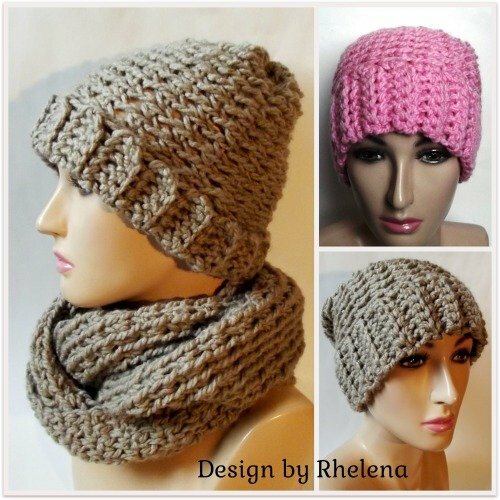 Here is the Charisma Slouchy Beanie to match the Charisma Cowl that was published several weeks ago. The beanie works up super quick and is comfortable to wear. Plus, you only need one skein of yarn, which makes it easy on the wallet as well. 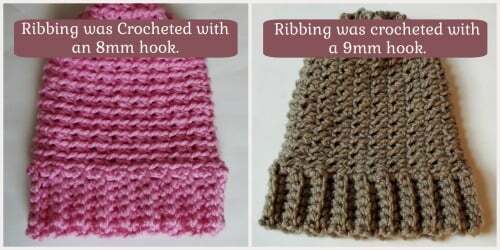 When I crocheted the first copy, I crocheted the brim with a 9mm crochet hook. It turned out great, but it wasn’t all that comfortable to wear at first. However, after a few washes it somehow conformed to my head and now it fits great. The second one was crocheted with an 8mm and it fit great from the get-go. So it’s totally up to you which hook you want to use for the brim. Another bonus of this beanie is that you can basically crochet it in any yarn and any size that you like. Gauge: 2″ over 4 ribbing rows and 2.5″ over 3 (sc, ch 1) sets. Finished Size: When laying flat, and with the 8mm hook it measures 9″ across the brim and 11″ top to bottom. However, you can make this hat as big or a small as like. Each end of ribbing row equals 1 st.
Row 2: Working in bl only, ch 1, sc in each st across. Turn. Rows 3-38: Continue with row 2 until you have reached a desired circumference making sure to end in an even number of rows. Begin working into the ends of the rows. Rnd 3: Continue working in bl only, ch 1, (sc, ch 1) in same st as join and into each sc st around. Do not work into chs. Join with sl st in both lps of first sc. Rnds 4-16: Continue with rnd 3 until you have reached a desired height. FO at last rnd leaving a long enough tail to weave through last rnd to close beanie. I went into the back lps on every sc st; then pulled it tight and weaved it in to secure. This beanie would look great with pom pom. Here is a short tutorial on how to make a pom pom. And be sure to check out more patterns in the Charisma series. 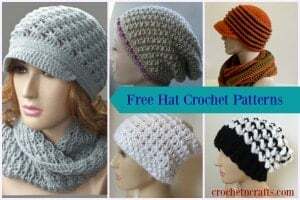 Or, check out this roundup of crochet winter hats. I used a Boye hook, but I imagine a plastic hook would work just as well.